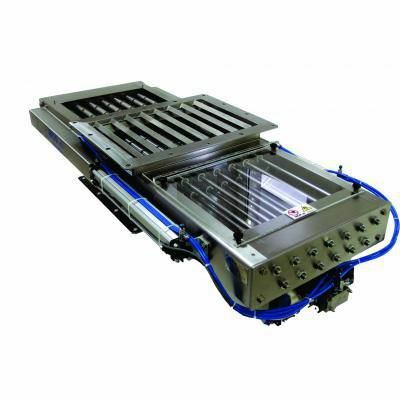 Packing - Handling - Logistics > Conveying > Magnetic separator > MDR d.o.o. Automatic separation of micron ferromagnetic contaminants. Custom made, customization to the customer’s needs. Automatic magnetic grid, with built-in high energy permanent magnets N52, is used for the automatic elimination of ferromagnetic impurities. Smooth separation of the metal impurities - possible to separate also metal impurities bigger than 5 µmm. 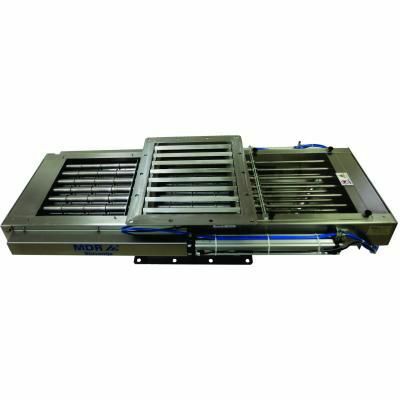 Cleaning cycle is programmable with control unit type KRM-2. Smooth flow of material through central part of the magnetic separator. Metal impurities, caught in the middle part of the separator, are eliminated automatically at given intervals. They are eliminated in the left or right area of separator without interrupting or stopping the production process. In sugar industry, because of the stickiness and dust of the product, we developed special protection cleaners for magnetic rods that are installed inside of magnetic grid. Because of this solution, with MRKA there is no problems with jamming of the material and MRKA automatic grid can also eject ferromagnetic particles from the liquids.